Well it’s here … the final project in Christi Friesen’s “Cats” book. *insert tears here* As we have gone through these tutorials, I have tried to save the biggest or best projects for last with the idea that after 2-3 weeks of practice you have worked yourself up to the “bigger” item. I hope that this has helped many of you succeed in creating your final projects for each month. Last month I received a lot of “kudos” for having a PDF tutorial that you could download, print, and take into your studios to do your final project. This month I think I’ve given you a little taste of everything: standard tutorials, a video tutorial, and a PDF tutorial. If there’s something else that you are craving, let me know and I’ll see what I can do. As with all the tutorials in the Friesen Project, please remember that these tutorials are done in an abbreviated format, with Christi Friesen’s expressed permission. These tutorials are written and designed to be used in conjunction with the Beyond Sculptures Book 4: Cats. 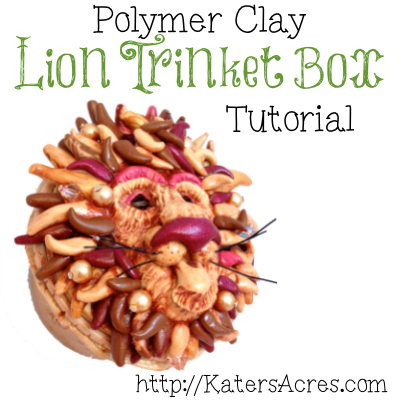 This week’s tutorial is a polymer clay trinket box with a “Big Cat” theme. This is a fun tutorial, but will take you approximately 2-4 hours to create, not including bake time. This tutorial employs the repurposing idea that we mentioned in a previous blog. Enjoy creating this fun box but more importantly, having fun using it! If you have already signed up for The Polymer Notebook, feel free to click on the graphic below to get your PDF Polymer Clay Trinket Box Tutorial featuring “Lions” from Christi’s Cat Book below. I’m visiting from crafty moose blog. Your polymer clay work is simply awesome!